Oops. Thanks to the all-stock nature of the transaction, that 25% premium has fallen to 19%. Exxon shares are down 4% this morning as investors worry they overpaid. And as XOM shares fall, so does the implied deal price, currently at 49.40, a 19% premium (XOM shares at 69.6 X .7098 = 49.4). XTO is trading at 47.81, leaving a not-too-shabby 3% premium for merger arb's to chase. But as Collins Stewart pointed out this morning, investors are upset that the deal price values Exxon's oil and gas reserves lower than what they paid for XTO's. Well to be fair, the price is certainly cheaper now as XOM shares (and the deal price) have fallen 4%. 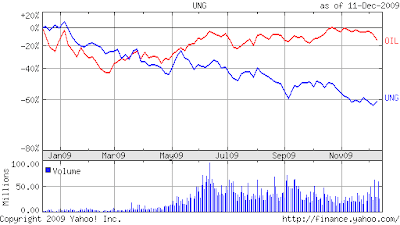 XOM may be betting that regardless of whose reserves are more generously valued, they see natural gas as underpriced. It is curious why the statement made by XTO Energy so embarrassed journalists?